Wipe disk on USB drive, external hard drives and memory cards. Want to Wipe Hard Drive completely? 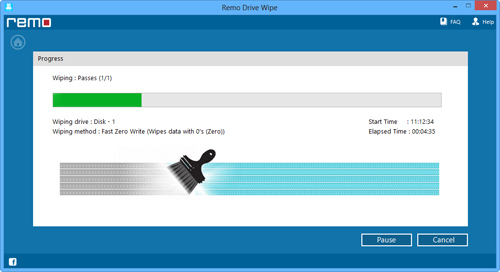 Drive Wipe is a reliable wipe disk software that is extensively used to permanently erase sensitive information from the hard drive. Generally, when you want to resell the storage devices like external hard drive, memory cards or USB drives, the personal and professional information that is stored on these devices should be deleted permanently to avoid misuse of personal or business data. Deleting files using any file management utilities like Shift+Del keys, Windows command prompt, Windows explorer or emptying the Recycle Bin does not permanently deletes the data from the storage devices. Even formatting or reformatting the hard drive or any other storage device destroys only allocation information stored in the file system, not actual data and such data can be easily recovered by data recovery tools. It helps to permanently shred deleted files from computer hard drives. Use of this advance application becomes compulsory for the user when they do not want to share their confidential information. If they just want to wipe a particular file or want to delete set of files permanently from computer hard drive or from any other data storage drive then you should use the most amazing Wipe Disk Tool. As we all know, data nowadays is not safe and many peoples save their confidential files in computer HDD or in other storage devices. However, sometimes user decides to sell or to dispose off the hard drive after formatting or by just deleting files and thinks that data is removed completely. But the actual fact is that, the information you just removed from data storage devices are still there and can be retrieved by file recovery softwares which are available in the market. With the help of these data recovery applications, your confidential data can be recovered easily and can be used for wrong purposes. If you do not want to see such state in your life where you don't know what to do, just use of Wipe Disk utility to erase files from data storage devices beyond recovery level. This advance application make use of standard data erasing methods which securely removes information in such a way that the files can not be recovered by any means. 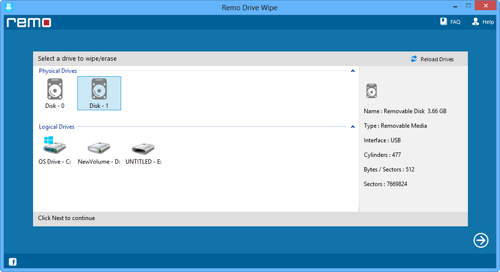 Drive Wipe also allows you to wipe memory cards, external hard drives, USB drives and other storage devices. This software can wipe disk on Windows 7, XP, Vista and Windows Server 2008 and 2003.This software overwrites the data several times using 9 different data shredding patterns or sanitization methods. Each data shredding pattern is categorized on the basis of their security levels. Peter Guttmann secure deletion is one of the most powerful pattern available with this software. This erase option overwrites the data area using 35 write passes.The pattern thereby wipes partitions from portable external hard drive completely. Step 1: Download the application and Install it on your computer. Step 2: Launch demo version of the application, main screen will be displayed with the list of logical drive and physical drive as illustrated in Figure 1. Choose the logical drive if you want to wipe the specific logical drive otherwise choose physical drive from the list to completely wipe the entire physical hard disk drive and then click on "Next" button to proceed further. 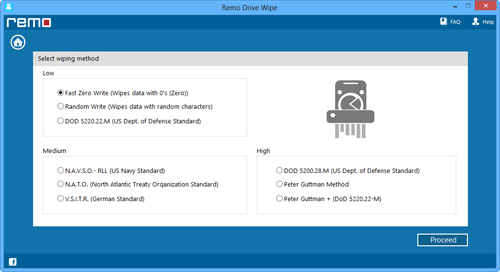 Step 3: On the next screen of the application, select the suitable drive wiping method from the list and then click on "Next" to proceed further. Step 4: As soon as you select the method and click on "Next", wiping process starts, you can see the progress bar as illustrated in figure 3. At the end of the process a message will be displayed on the screen stating completion of the wiping process.